In the past I've purposefully avoided doing a BTN on Kevin Costner because of my mixed feelings about him (I'll explain in a few). However, in a flood themed week, how could I not crunch the numbers on the star of Waterworld? Oh yes, I'll stoop that low for a bad joke. A quick rundown of how this works for anyone new to the process. My favorite childhood movie was Robin Hood: Prince of Thieves. I was an unusual geek amongst my peers. I read every Robin Hood and King Arthur book I could get my grubby little hands on. So in the role of Robin Hood, I have always loved Kevin Costner. Now every other role he's done... I feel he's played pretty much the same exact character. And even though I love Wyatt Earp, again, it's still the same role. So while I wasn't exactly rooting for him to lose, I wasn't exactly pulling for him either. Oh wait, there's the whole singing thing... I guess I was rooting for him to fail. At any rate, the numbers don't lie. 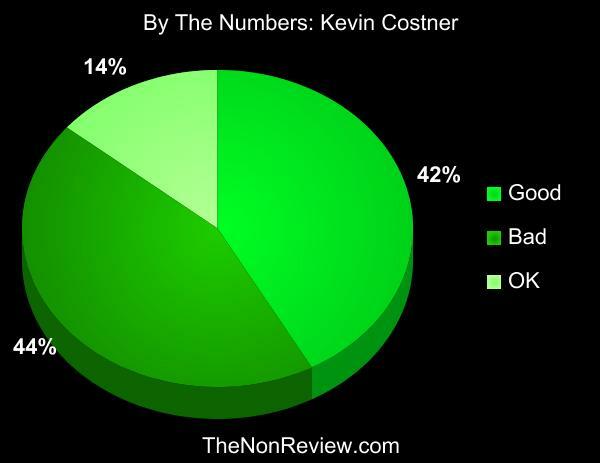 With a measly 56% positive over 44% negative, Kevin Costner is officially in actor's jail. Thanks to AsBlackAsObama for this week's pick. Say it ain't so, Kev. Say it ain't so. This is what happens when you don't lay up on the 18th hole. You lose. Oh man, oh man! TS we would have been geeks in love when I was a kid. I'll have to dig out the short story I wrote when I was in the 4th. Of course you would have been like 4 at the time...star wars crossed lovers? I don't care who you are, as far as playing the same role time and again...nobody has the numbers of Keanu Reeves. Nobody. In fact I'm going to override your final score and throw in an extra ten percent 'good', just because Kevin had the good sense not to be born Keanu. I'd say you hit the target on this one. Though I really did like Silverado! I agree that Costner was very good in Silverado. Nothing else was good in Silverado, though. My wife loves him and everything has has done. There is one whole section of our movie collection that KC movies. For me he's already. Liked Bull Durham but he could have stopped the baseball movies after that. Good review. I am the only person, that I am blood related to, that likes KC. I somehow missed the hate-kc gene, and enjoy just about all the movies I've seen him in. Now, I haven't seen his really bad movies, because I tend to avoid really bad movies for the sake that they are really bad movies. So I'm a poor judge I suppose, but I was pulling for him, even though I knew it was like pulling for Keanu to win an Oscar. How can someone go from doing 'Field Of Dreams', 'Bull Durham', 'Dances With Wolves', 'Wyatt Earp' and 'Robin Hood' end up in 'Swing Vote'?